In 1927 Dr. Walter E Brandner moved to Petaluma after graduating from Cornell Veterinary School and opened an animal hospital at the corner of Fourth and B Streets in the Rex Hardware building, also taking over the directorship of the Petaluma Laboratories which had been established in 1923. In 1931 the Petaluma Laboratories moved away from town and the new Brandner Laboratory and Hospital were started, still in the same location. Dr Brandner hired architect Mario Corbett of San Francisco, who also designed Hope Lutheran Church in Daly City, to design the blueprints for the building at Second and D Streets in 1949. The original veterinary hospital contained a laboratory and retail sales rooms as well as boarding facilities for up to 50 dogs. In those days, the ranch calls were answered by the doctors and staff in blue Plymouth vans. Chain link fencing by Tomasini Hardware Co.
Refrigeration by Rex Hardware Co. Plumbing by Petaluma Pump & Well Co.
Radiant heating (still in use today) was installed by P. A. Van Bebber. Petaluma Rotary Club, under the direction of President Art Dahlgren, held a Thursday luncheon at the new facility before it opened in 1950, catered by Howard Fox and the Hotel Petaluma staff. Sadly, Dr Brandner was killed in 1962 in an auto accident near Penngrove. Eventually his son Dr. Charles Brandner, also a veterinarian, built a new facility on Lakeville Street at Jefferson and moved the family practice there. Dr. John Zimmerman had taken over the large animal practice and retail storefront operations by the early 1970’s and continued to operate out of the same building until 2003. Meanwhile Dr. C Robert Stewart and his wife Ruth purchased the small animal practice in 1976. Dr. Stewart was a 1954 graduate of Colorado State Veterinary School and had worked at the San Francisco SPCA while living in Petaluma for 15 years before buying the practice. He continued to run the small animal operations until 2002 when he retired and sold the business to Dr. Matthew Carter and his wife Jennifer. Dr. Carter graduated from UC Davis School of Veterinary Medicine in 1995 and first went to work with both large and small animals in the central valley area of Oakdale, California. He spent 2 years working as a veterinarian in and around London, England and several years working with small animals in the Bay Area before coming to Petaluma. In 2003, Dr. Zimmerman, his partners Dr. Myron Heinrichs and Dr. Mike O’Connor and their associates bought their own building across town on Industrial Avenue leaving the entire property here on D Street to small animal operations. The Carters first upgraded the inside of the building adding examination rooms, an indoor playroom for daycare dogs, a separate room for boarding cats and completely modernizing the treatment areas. Digital phone lines, low-E glass, air conditioning and many other modernizations were put in place to meet the needs of the new century. By April 2007 they finished the remodeling project with the outside of the building, adding landscaping and an improved entrance. In 2015 a solar array was added to power the building using renewable energy. The Carters continue to operate the small animal hospital with the help of Dr. Tim Helms, Dr. Alman, Dr. Jack Long and a staff of 12 veterinary technicians and assistants, customer care specialists and boarding staff. The team recently celebrated being voted “Best Veterinarian” 2016 by the readers of the Argus Courier and Petaluma 360.com. 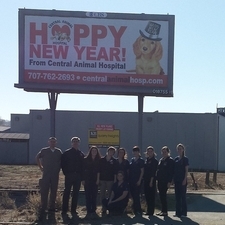 Although the roots of Central Animal Hospital go back to the 1920’s and the building to 1950, we are still a highly modern veterinary practice. Today, we use computers to maintain our paperless medical records, we use digital X-rays and have lasers in our laboratory equipment. Many things have changed but we’re still most proud of being a part of this great Petaluma community.